Costello's done it again. 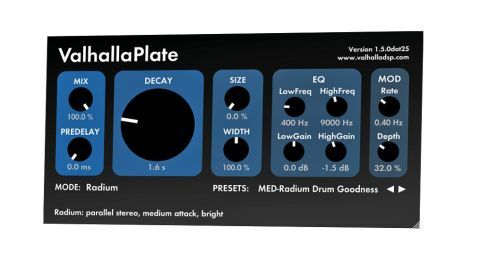 Valhalla Plate is an absolutely essential reverb plugin that no producer should be without. Incredible! Great choice of plates. Well organised presets. Simple interface. Goes beyond real plate decay limits. Adjustable plate size. With three rather fine reverbs (VintageVerb, Room and Shimmer) and one excellent modulation/delay (Ubermod) already under his belt, a plate reverb emulation feels like the next logical step for Valhalla DSP's Sean Costello. As it transpires, Valhalla Plate (VST/AU/RTAS/AAX) has been on the completion list for some time, with an ongoing development process incorporating analysis of various EMT 140s with the assistance of Seattle engineer Don Gunn. Valhalla Plate follows the developer's established 2D design ethos with minimal controls - just 11 knobs and two dropdown menus. Each of the plugin's 12 Modes provides a different plate 'flavour', influencing the attack (fast, soft, medium and so on), colour (dark or bright) and density, ably demonstrated by a set of appropriately foldered (Small, Medium, Large, Huge) and sensibly labelled ('MED-Perfect Tom Plate', for example) presets. The main adjustable parameters comprise Decay (0.5-30secs), Predelay (up to 500ms), gentle high and low shelving EQs (200Hz-20kHz and 20Hz-2kHz respectively, with +/-12dB of cut or boost), and reverb Mix. There's also chorus- style modulation on tap via the Rate (0.05-5Hz) and Depth (0-100%) knobs, and two further decay controls, Size and Width, ranging from 0%-200%, with 100% being the default setting. The Width control behaves as you'd expect (0% is mono, for example), while the Size control not only adjusts the physical size of the plate (not something you could do in reality), but is also particular to each model. Smaller settings typically creating a more metallic sound, and larger settings a smoother, denser sound. Plate reverbs typically have instant onset, short high-frequency decay (the mid-range usually defines the decay time), and a slightly weird but pleasant stereo image. Valhalla Plate emulates all of this perfectly while giving an amazing amount of sonic variety from mode to mode. From the reasonably neutral and spacious Chrome and Steel modes, via the upfront and brighter Brass, to the darker Titanium and Lithium, the base options, even before you start editing them, are quite excellent. Every model has its own depth, resonant character (Osmium picks up snare body beautifully, for example) and stereo image, and our favourites are Unobtanium (quite bright and wide) and Radium (wonderfully unobtrusive). When you want to tweak, the EQ is powerful enough to curtail mid and low build-up and boost the top end for splashy effects, and the modulation delivers adequate (though not excessive) wobble. Clearly, a lot of time and thought has gone into Valhalla Plate, taking it way beyond simply a slavish EMT 140 emulation, but retaining the subtlety and nuance required of any quality hardware emulation. And with so many models to call on, it goes some way towards recreating the inevitable variation between echo plates in the real world. We love this plugin, you'll love this plugin, and at $50, it's an absolute steal.